Resident of Mogpog town in Marinduque prepare for the annual Moriones Festival, an annual recreation of the the life of Saint Longinus. Longinus was the half-blind centurion tasked with driving a spear into the side of Jesus. When Jesus’ blood touched him, Longinus’ vision returned. He then converted to Christianity and turned his back on his fellow centurions. 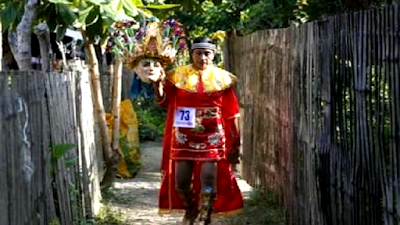 Ella Mazon carries her Morion (mask) as she walks in an alley outside her house. The weeklong festival started on Palm Sunday and culminates on Easter Sunday. 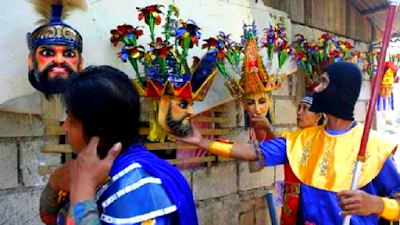 During this week, participants brave the heat in full centurion garb, looking for the fugitive Longinus.